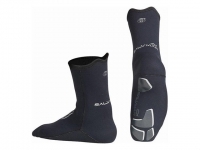 Spearfishing-Shop - Spearfishing Equipment - Socks Salvimar Drop Neoprene 5 mm. • The extra strong soles of the Salvimar 'Drop' boots have an anti-slip layer to avoid skidding or slipping on wet rocks or the boat's deck. • The Salvimar 'Drop' boots have double lining, which make them last longer. Main page » Catalogue » Socks » Socks Salvimar Drop Neoprene 5 mm.